The Excalibur coating is considered by many to be the toughest, longest-lasting, and most durable non-stick coating in the world. The difference between Excalibur and comparable coatings is that Excalibur is a complete coating system, rather than simply a coating applied over an existing substrate. Excalibur’s system begins when stainless steel is arc-sprayed onto a component, actually becoming a part of it. The stainless-steel matrix is then impregnated with premium nonstick coatings. The result: a coating system with the toughness of stainless steel and the “release” properties of the best non-stick – the most durable coating system ever created. 1. First, the surface of the pan’s substrate is blasted with an abrasive to roughen it, so that other elements in the Excalibur system adhere to it better. 2. Then, the most important part: White-hot particles of a special stainless steel (an alloy patented by Whitford) are sprayed onto the roughened surface. 3. The particles cool and harden, welded to the surface, forming a series of “peaks” and “valleys” that provide a permanent base for the nonstick coatings. 4. Several coats of tough fluoropolymers fill the “valleys” and cover the “peaks”, locked permanently into place by the stainless-steel “peaks”. Toefco is among a limited number of firms worldwide to achieve ExcalNet status as a licensed Excalibur applicator. This designation requires intensive training, specialized equipment, and an ongoing commitment to maintaining the highest level of application quality in this superlative coating. The most common complaint about fluoropolymer coatings is that they wear out too quickly. That’s why nonstick coatings were rarely seen on expensive cookware and found little success in industrial applications. To solve this problem, Whitford’s research and development team created Excalibur and patented the formula years ago. The Excalibur coating is far more than a fluoropolymer coating. It is a unique, externally reinforced system. What makes it different from — and superior to — other coating systems is its remarkable resistance to wear and all types of abrasion. As the diagrams illustrate, a patented stainless-steel alloy is sprayed onto a roughened substrate at extremely high temperatures. The molten particles cool and harden, welded to the surface of the pan. They form a matrix of “peaks” and “valleys” that provide a permanent, rigid base for the coatings. Three coats of tough fluoropolymer are applied, filling the “valleys” and covering the “peaks.” The coatings are locked into place by the stainless-steel matrix. Excalibur actually becomes a part of the surface to which it is applied, offering the strength of stainless steel with the low friction and release of the finest non-sticks. Whitford R&D has been working on internally reinforced coatings for several years now, developing various options to suit a variety of needs. The option most suited for combination with Excalibur was selected and added to the system. Now this unique coating is reinforced externally as well as internally. Excalibur is ideal for high-end cookware (especially stainless-steel cookware) and thousands of industrial applications. Now, with the new formula, Excalibur is better than ever. 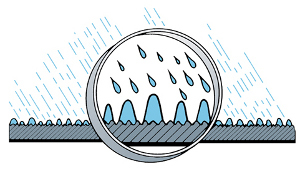 There are more than 30 types of stainless steel, most of which are inappropriate for use in wet environments. Shown here are five of the best, plus Whitford’s patented alloy. The principal difference among the six are the types and amounts of metals used in the alloy, which can affect the corrosion resistance. However, when stainless steel is arc-sprayed onto a surface, the intense heat changes the alloys, reducing the amount of rust resistance. In the test shown here, each of the six types of stainless steel was sprayed onto a glass panel, then subjected at the same time to 15 hours in a Salt Spray Cabinet at 5% NaCl at 35°C/95°F (ASTM B-117). Excalibur’s alloy shows far less rust than all the others. That’s why Excalibur — and only Excalibur — is patented. And that’s why care must be taken when purchasing any so-called “reinforced” coating. They are not the same. Have questions on the use of Excalibur coatings in your application? Talk to a Toefco Excalibur industrial coating engineer today.